Most computer users will come across files which they don’t have an associated program to edit, view or play them etc, or perhaps you may have a type of file that you prefer to work on in a specific format. With so many different types of file around, it’s not uncommon for the need to convert between different file formats now and again. But what about if you find the audio conversion tool you’re looking for, and then decide you want to convert some images or even documents as well? Usually you would have to find a tool which converts documents, another one for images, and yet another one for audio and video files, and so on. What could be useful is a tool to convert just about any type of file format you want, but a free universal file conversion program is very hard to come by. Another solution is to convert the files using an online service which can handle many types of file and you don’t need to install any software to get the conversion done, just a web browser is required. Most online services do have some limitations such as a file size limit, but for general usage, they’re more than enough. Here’s a selection of 7 tools that could help get your files converted. If you want specific conversions for the PDF format, we have covered that before in another article. The free version of Zamzar supports files of up to 100MB in size, only the paid offerings allow for more. 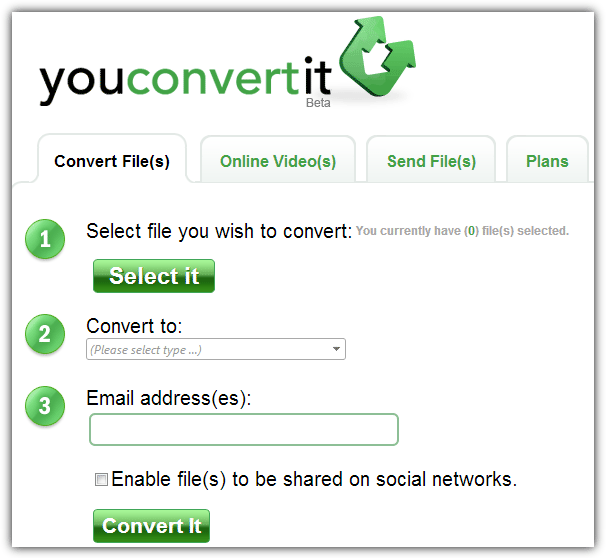 The list of what you can convert from and to is one of the largest around, and you can also convert up to 5 files of the same format at once to a single output format. Finished conversions are sent as a link via email and will stay valid for 24 hours. Zamzar also supports converting files via URL with around 15 video sharing websites such as Google video and MySpace also available. Fileminx as a small service by comparison to some of the others and only has a 50MB upload limit, the list of supported document, image, audio and video formats is only around 60 as well. Where it does make up for that though, is being very easy and simple to use, just upload your file or provide a URL, press Continue and click on one of the output icons. The finished file will then be available as a download link. If you don’t want to worry about registrations or waiting for files to be sent to your inbox, FileMinx is worth a look. Convert Files can handle files of up to 250MB and supports over 330 combinations of input and output formats. The links to the file remain valid and will be destroyed after 24 hours. There are several conversion file types to choose from including all of the popular formats for video, audio, ebook, document, archive and image. Some video sharing sites are also available although the focus does seem to be on those of a more adult nature. A useful page is the Mobile Devices page which lists all the supported audio and video formats for your brand of smartphone or tablet. 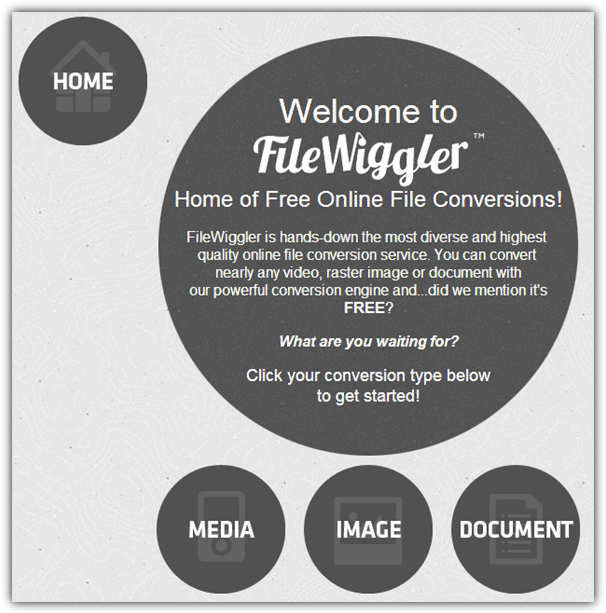 Unregistered FileWiggler users can upload 5MB documents or 200MB media files as standard, register for free and that goes up to 10MB and 300MB respectively. The site is split into 3 main conversion tools; Media, Image and Document, and the list of supported conversion formats in each is quite large. The completed file will be sent to the email address you provide and unregistered users will receive the lowest priority speeds. File Wiggler also supports converting from video sites such as Youtube, Google Video and Dailymotion. Youconvertit has a selection of free and paid plans, the unregistered public users can upload files of up to 60MB and the files will expire after 3 days. Registered free users get a bit more and can upload 100MB files which are also slightly higher up in the priority list. The size of the list for what you can convert from and to is pretty extensive with all but the most obscure types included. The online videos tab will also convert from video sharing sites but unfortunately Youtube is no longer supported. Finished files are sent to an email address and not downloaded directly once complete. This free service supports a sizable mixture of audio, video, image and document formats. There is also support for downloading videos direct from some online video hosting sites such as bloomberg, vimeo and ted.com. For a free service, the 300MB file size limit is pretty good and obviously what you can convert to depends on the input file. Once your file has been converted, it will also be available as a compressed zip file to save a bit of space. The download link to retrieve your file will be available for 12 hours. This service has a number of conversion tools for different types of file format, and can convert files of up to 100MB which will be deleted after 24 hours or when the file has been downloaded 10 times. There are different tools to convert audio, video, images, documents, ebooks, archives and even a file hash generator for input text or a file. 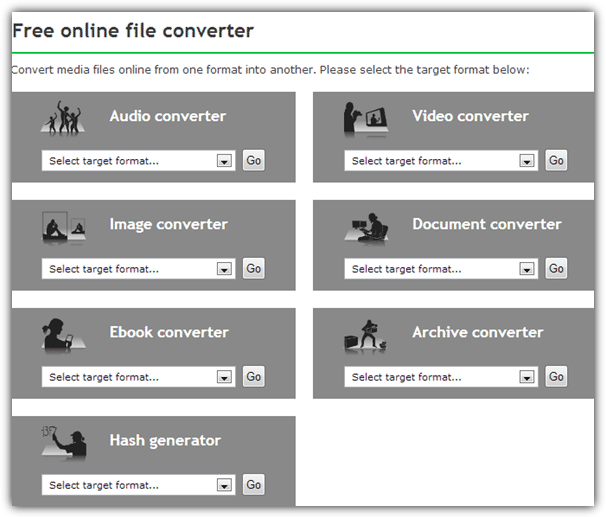 Simply find the “Convert to…” format you want, upload your file or enter a link to an online file and press the button. The file will automatically download once it’s ready. Good to know these video converting tools and thanks for the sharing. I’d also recommend Acethinker Video Converter which I have used for many years. It’s a free web-based application to convert videos, you may add it to the list as well. Thank you for this useful and resourceful list. I specially enjoyed your descriptions for each website. They are right on slot! I have been using zamzar for a long time now. Zamzar does have one of the most effective capabilities when it comes to converting files, and the range of Files they convert is also incredible. But if you are looking for an website that not only covers a huge range of files but also provides smoothest interface, you might wanna have a look at Convert.world. This website is a masterpiece when it comes to convert like a pro. You just have to visit, click & receive. Yes, that’s how easy the website is to operate. Greatest range and simplest interface – Making the best of your time! …and that’s the problem of old Microsoft Publisher (.PUB) files not being readable by newer versions of Microsoft Publisher. It’s unbelievably ridiculous that Microsoft hasn’t ensured that any .PUB file, created by any version of its Microsoft Publisher software, may be read by all subsequent versions. I, for one (and from my research, it turns out there are many of us) have hundreds and hundreds of very old Microsoft Publisher files, from back when Publisher was in its 1st version; then I upgraded to… I think it was its third or fourth version… and I suddenly couldn’t read any of the old files. Then, a few versions later, I couldn’t read any of the files from even the third or fouth version. Basically, no version of Publisher may read files from two or three versions back; sometimes even only one version back. What software company would do such a thing? It’s outrageous. Shame on Microsoft for this huge misstep. So, then, my point is that any converter company — be it online, or a desktop app — which can convert any .PUB file, regardless of age or version, into any other reasonable file format (like Word or PDF); and, especially, if it can convert any age .PUB file into any more current version .PUB file, will have fixed a long-standing problem that has been vexing Microsoft Publisher users for literally decades. It’s such a huge problem that I’ve considered hunting-down every old version of Publisher at used software stores or whatever it takes, and then dedicating an old, no-longer-used PC to running them all; and then offering the conversion service to people for a tiny fee. And I mean tiny: if I could, I’d offer it as a public service, it’s been such a problem for so long! If any of the file conversion site or software makers are reading this, please see what you can do. Please! Thank you Raymond – noted and filed.